The role of peroxisome proliferator-activated receptor γ (PPARγ) in adipocyte physiology has been exploited for the treatment of diabetes. The expression of PPARγ in lymphoid organs and its modulation of macrophage inflammatory responses, T cell proliferation and cytokine production, and B cell proliferation also implicate it in immune regulation. Despite significant human exposure to PPARγ agonists, little is known about the consequences of PPARγ activation in the developing immune system. Here, well-characterized models of B lymphopoiesis were used to investigate the effects of PPARγ ligands on nontransformed pro/pre-B (BU-11) and transformed immature B (WEHI-231) cell development. Treatment of BU-11, WEHI-231, or primary bone marrow B cells with PPARγ agonists (ciglitazone and GW347845X) resulted in rapid apoptosis. A role for PPARγ and its dimerization partner, retinoid X receptor (RXR)α, in death signaling was supported by 1) the expression of RXRα mRNA and cytosolic PPARγ protein, 2) agonist-induced binding of PPARγ to a PPRE, and 3) synergistic increases in apoptosis following cotreatment with PPARγ agonists and 9-cis-retinoic acid, an RXRα agonist. PPARγ agonists activated NF-κB (p50, Rel A, c-Rel) binding to the upstream κB regulatory element site of c-myc. Only doses of agonists that induced apoptosis stimulated NF-κB-DNA binding. Cotreatment with 9-cis-retinoic acid and PPARγ agonists decreased the dose required to activate NF-κB. These data suggest that activation of PPARγ-RXR initiates a potent apoptotic signaling cascade in B cells, potentially through NF-κB activation. These results have implications for the nominal role of the PPARγ in B cell development and for the use of PPARγ agonists as immunomodulatory therapeutics. Peroxisome proliferator-activated receptors (PPARs)3 are members of the nuclear hormone receptor superfamily. There are three PPAR subtypes, α, δ, and γ. PPARα is expressed highly in metabolically active tissues such as liver, heart, and kidney and regulates the uptake, activation, and β-oxidation of fatty acids (1). Recently, PPARα has been found to be expressed in myeloid and lymphoid cells (2). PPARδ is ubiquitously expressed (3) and plays a role in embryonic development and adipocyte physiology (4). Alternative splicing and promoter use result in the formation of the PPARγ isoforms (5, 6). While the distribution of PPARγ2 is largely restricted to adipocytes, PPARγ1 is more widely expressed and is the isoform found in tissues of the immune system (3, 7). PPARγ plays an important role not only in regulating adipocyte differentiation (8, 9) and insulin responsiveness (10), but also in immune function, particularly in macrophage inflammatory responses (11, 12, 13, 14, 15); T cell activation, proliferation, and production of inflammatory cytokines (16, 17, 18); endothelial cell production of chemokines (19); dendritic cell maturation (20); and B cell proliferative responses (21). PPARγ is a ligand-inducible transcription factor. Natural ligands for this receptor include 15-deoxy-Δ12,14-PGJ2 (15d-PGJ2) (22) and 9- and 13-hydroxyoctadienoic acid (23). Synthetic ligands for PPARγ include thiazolidinediones and tyrosine analogs, developed for the treatment of type II diabetes and investigated as chemotherapeutics (23), as well as a metabolite of di[2-ethylhexyl]phthalate, a major environmental pollutant (24). Following ligand binding, PPARγ forms a heterodimeric complex with retinoid X receptor α (RXRα), allowing binding to PPAR response elements (5′-AACTAGGNCAAAGGTCA-3′, consensus sequenceunderlined) (25) within promoters of PPARγ target genes. Ligand binding initiates a conformational change that results in the dissociation of corepressors and the association of coactivators, allowing ligand-induced trans-activation (26, 27). Providing ligands for both PPARγ and RXRα results in additive or synergistic activation of transcription (28, 29, 30, 31). PPARγ mRNA and/or protein are expressed widely throughout the immune system, including in mature B cell lines and primary populations (2, 7, 32), splenic white pulp, Peyer’s patches germinal centers, and human lymphoid follicles (7). PPARγ’s dimerization partner RXRα has been shown to be expressed in mature B cells (33). A physiological role for PPARγ in B cell function is suggested by an increased proliferative response and enhanced Ag-specific immune response of mature B cells from PPARγ haploinsufficient mice (21). However, little is known of the expression or function of PPARγ or its dimerization partner, RXRα, in primary pro- or pre-B cells. The effects of PPARγ agonists on these developing lymphocytes are of particular concern given the increased sensitivity of the developing immune system to other environmental chemicals (34, 35, 36, 37) and therapeutics (38), and the recent consideration of PPARγ agonists as tumor-specific therapeutics (39, 40, 41, 42, 43, 44, 45). Also of note is the ability of PPARγ to modify the activity of other transcription factors involved in lymphocyte function and survival, particularly NF-κB. Our laboratory and those of other investigators have demonstrated that modulation of NF-κB in pro/pre-B and immature B cells through a variety of stimuli results in apoptosis (46, 47). Most studies with PPARγ agonists suggest that PPARγ activation down-regulates NF-κB-DNA binding and trans-activation stimulated by activators such as LPS, TNF-α, PMA, and IL-1β in a variety of cell types (48), including macrophages and T cells (13, 14, 15). However, in some circumstances, PPARγ can bind DNA cooperatively with NF-κB (49, 50) and enhance NF-κB-DNA binding (51). Because of these results, the expression of PPARγ in mature B cell populations, and the suggestion that PPARγ plays a role in mature B cell responses, we sought to determine whether PPARγ agonists adversely affect the developing immune system by inducing bone marrow-derived B cell apoptosis, potentially through NF-κB dysregulation. These issues were addressed using two PPARγ agonists of significantly different molecular structures: ciglitazone (a thiazolidinedione), and GW7845 (a tyrosine analog), a previously described bone marrow stromal cell-dependent pro/pre-B cell line (BU-11), and a well-characterized transformed immature B cell line (WEHI-231). The data show that the developing B cell compartment is exquisitely sensitive to PPARγ agonists and are consistent with a role for PPARγ-RXRα-mediated modulation of NF-κB activity in the induction of an extremely rapid and potent apoptosis signal. Ciglitazone, 9-cis-retinoic acid, and poly(ADP-ribose) polymerase (PARP)-specific Ab were obtained from Biomol (Plymouth Meeting, PA). GW347845X was provided by Dr. T. Willson (GlaxoSmithKline, Research Triangle Park, NC). PPARγ-specific Ab was obtained from Calbiochem (San Diego, CA). NF-κB-specific Abs were purchased from Santa Cruz Biotechnology (Santa Cruz, CA). Propidium iodide and Protease Inhibitor Cocktail for Mammalian Cells were obtained from Sigma (St. Louis, MO). Annexin V-PE, annexin V-FITC, and the PE-labeled B220-specific Ab were purchased from BD PharMingen (San Diego, CA). Murine IL-7 was obtained from Research Diagnostics (Flanders, NJ). Cell Proliferation Kit I was purchased from Roche (Indianapolis, IN). Plasmocin was obtained from Invitrogen (San Diego, CA). All other reagents were purchased from Fisher Scientific (Suanee, GA) unless otherwise noted. B cells were isolated from the bone marrow of 8- to 10-wk-old C57BL/6 male mice by the method of Tze et al. (52). Cultures were determined to be >80% B220+ following preparation by this method. The stromal cell-dependent, C57BL/6-derived BU-11 cell line has been characterized previously (35, 37). BU-11 cells represent B cells at the transition between the pro- and early pre-B cell stages as they are CD43+/B220+/IgM− with rearranged Ig heavy chain genes (53). BMS2 is a culture dish adherent cloned bone marrow stromal cell line that supports BU-11 cell growth (54). Cultures of BU-11 cells maintained on BMS2 cell monolayers were grown in an equal mixture of DMEM and RPMI 1640 medium with 5% FBS, Plasmocin, l-glutamine, and 2-ME. For experiments, BU-11 cells were plated without BMS2 in the presence of IL-7. WEHI-231 (immature B) cells were grown in DMEM with 5% FBS, Plasmocin, l-glutamine, and 2-ME. All cultures were maintained at 37°C in a humidified 7.5% CO2 atmosphere, and all experiments were conducted under these conditions. Cell cultures were determined to be mycoplasma negative by PCR (Mycoplasma Detection kit; American Type Culture Collection, Manassas, VA). Primary bone marrow B cells were treated in 24-well plates with ethanol (vehicle; final concentration, <0.1%), ciglitazone, or GW7845 (20–100 μM) for 4 h. For B220/annexin V double staining, the cells were collected and washed in cold PBS containing 5% FBS and 10 mM azide. PE-labeled B220-specific Ab was added, and the cells were incubated in the dark at 4°C for 30 min. Cells were resuspended in 150 μl annexin V binding buffer containing 10 mM HEPES (pH 7.4), 140 mM NaCl, and 2.5 mM CaCl2. Annexin V-FITC (2.5 μl) was added. The cells were incubated in the dark at room temperature for 15 min and were analyzed in a FACScan flow cytometer (BD Biosciences, Mountain View, CA). BU-11 and WEHI-231 cells were treated in 24-well plates with ethanol (vehicle; final concentration, <0.1%), ciglitazone (80 μM), or GW7845 (60 μM). For propidium iodide staining, cells were treated for 4–6 h, harvested by gentle pipetting, and washed once with cold PBS containing 5% FBS and 10 mM azide. Cells were resuspended in 0.25 ml hypotonic buffer containing 50 μg/ml propidium iodide, 1% sodium citrate, and 0.1% Triton X-100 and were analyzed by flow cytometry. Cells undergoing apoptosis have a weaker propidium iodide fluorescence than those in the G0/G1 phase of the cell cycle (35, 37). For studies of PPARγ and RXR agonist synergy, BU-11 were treated with ethanol (vehicle; final concentration, <0.1%) or ciglitazone (10–20 μM) and 9-cis-retinoic acid (10–20 μM). Eighteen hours later cells were harvested, stained with propidium iodide, and analyzed by flow cytometry as described above. For annexin V staining, cells were treated for 4–6 h, harvested by gentle pipetting, and washed once with cold PBS containing 5% FBS and 10 mM azide. Cells were resuspended in 150 μl annexin V binding buffer, and 2.5 μl of annexin V-PE was added. The cells were incubated in the dark at room temperature for 15 min and were analyzed by flow cytometry within 1 h.
For determination of DNA fragmentation, cells were treated for 2–6 h, harvested by gentle pipetting, and washed once with cold PBS. Cells were lysed in 0.4 ml of lysis buffer containing 10 mM Tris (pH 8), 1 mM EDTA, ad 0.2% Triton X-100. Samples were centrifuged, and DNA was extracted from the supernatant using phenol and chloroform and precipitated with ethanol. DNA was recovered by centrifugation, dried, and quantified. Before loading on a 1.5% agarose gel, the DNA was treated with 10 μg/ml RNase A at 37°C for 10 min. DNA was visualized using ethidium bromide staining. For detection of PARP cleavage, cells were treated for 2–6 h, harvested by gentle pipetting, and washed once with cold PBS. PARP cleavage was detected by Western blotting using specific pAb (SA-253). Samples were prepared, electrophoresed, and immunoblotted according to the manufacturer’s instructions. A 3-[4,5-dimethylthiazol-2-yl]-2,5-diphenyltetrazolium bromide (MTT) assay (Cell Proliferation Kit I) was used to rapidly quantitate cell death in multiple samples simultaneously. BU-11 and WEHI-231 cells were plated in 96-well plates and were treated with ethanol (vehicle; final concentration of <0.1%), ciglitazone (1–100 μM), or GW7845 (1–100 μM) for 2 h. MTT reagent was added, and the incubation was continued for 4 h. Solubilization buffer was added, and the cells were allowed to solubilize overnight at 37°C. Absorbance was determined at 562 nm using a spectrophotometric plate reader. Cytoplasmic and nuclear proteins were isolated as follows. Cells were resuspended in P10EG lysis buffer containing 10 mM sodium phosphate (pH 7.5), 0.75 mM EDTA, 10% glycerol, 0.75% Triton X-100, 0.5% protease inhibitor cocktail for mammalian cells, and 1 mM PMSF. Plasma membranes were broken by pipetting, and the quality of nuclear isolation was determined by visual inspection. Nuclei were pelleted by centrifugation for 2 min at 13,000 × g at 4°C. The resulting supernatant containing cytoplasmic proteins was collected and stored at −80°C. Nuclear pellets were washed in P10EG and resuspended in cold nuclear lysis buffer containing 20 mM HEPES (pH 7.9), 420 mM sodium chloride, 1.5 mM magnesium chloride, 1 mM EDTA, 25% glycerol, 0.1% Triton X-100, 1 mM DTT, 1 μg/ml aprotinin, 1 mM sodium orthovanadate, 10 μg/ml leupeptin, and 1 mM PMSF. Nuclei were incubated for 30 min on ice and centrifuged for 15 min at 13,000 × g at 4°C. The supernatant containing nuclear proteins was collected and stored at −80°C. Protein content was determined by the Bradford method. Cytoplasmic proteins (70 μg) were resolved on 10% SDS-PAGE gels, electrophoretically transferred to 0.2-μm pore size nitrocellulose membranes, and incubated with pAb specific for PPARγ (no. 516555). The secondary Ab was HRP-linked goat anti-rabbit IgG (Bio-Rad, Hercules, CA). Immunoreactive bands were visualized using enhanced chemiluminescence. RXRα expression was determined by Northern blot. Total RNA was isolated using RNeasy (Qiagen, Valencia, CA). Ten micrograms of total cellular RNA were electrophoresed on a 1% formaldehyde agarose gel and blotted onto a ζ probe transfer membrane (Bio-Rad, Mississauga, Canada). The membranes were hybridized to DNA probes labeled by Ready-To-Go DNA labeling beads (Amersham Pharmacia Biotech, Piscataway, NJ) and purified with ProbeQuant G-50 Micro Columns (Amersham Pharmacia Biotech). Hybridizations and autoradiography were performed as previously described (55). The radiolabeled probe was isolated from the plasmid containing a 1.8-kb EcoRI fragment of RXRα cDNA (56) . BU-11 cells were plated in T75 flasks and treated with ethanol (vehicle; final concentration, <0.1%), ciglitazone (10–70 μM), GW7845 (10–60 μM) and 9-cis-retinoic acid (40 μM) for 15 min to 8 h. Cells were collected and washed in PBS. Nuclear proteins were extracted as described above. For determination of NF-κB activation, a double-stranded oligonucleotide containing the NF-κB binding site from the upstream κB regulatory element (URE) of c-myc (5′-GATCCAAGTCCGGGTTTTCCCCAACC-3′) (57) was used. The consensus sequence is underlined. The DNA probe was end-labeled using T4 polynucleotide kinase (Promega, Madison, WI) and [γ-32P]ATP, and was purified using a Centrispin-20 column (Princeton Separations, Adelphia, NJ). EMSA was performed as follows. The 32P-labeled DNA (∼0.5 ng, 50,000 cpm) and 2 μg of nuclear protein were combined with buffer (final concentrations: 10 mM Tris-HCl (pH 7.5), 1 mM EDTA, 100 mM sodium chloride, 0.5 mM magnesium chloride, 1 mM DTT, 10% glycerol, and 0.5% Triton X-100) and poly(dI-dC) (1 μg) in a final volume of 20 μl. The mixture was incubated at room temperature for 30 min. Polyacrylamide gels (16 cm, 5%) were prerun at 200 V for 30 min. Mixtures were electrophoresed at 200 V for 1.5 h in 0.5× TBE (final concentrations, 44 mM Tris-base (pH 8), 44 mM boric acid, and 0.8 mM EDTA). The gels were dried and exposed to film. For quantification, the gels were analyzed by phosphorimaging on a PhosphorImager (Molecular Dynamics, Sunnyvale, CA). The specificity of the shifted bands was determined by including 100× cold oligonucleotides containing the NF-κB site for the URE of c-myc or an unrelated site (5′-GAGCCGCAAGTGACTCAGCGCGGATCAATTA-3′). The identities of the NF-κB subunits were determined by including Abs specific for p50 (sc-114), p52 (sc-848), Rel A (sc-372), or c-Rel (sc-71) and looking for the presence of supershifted bands. For determination of Oct-1-DNA binding, the above procedure was used with the consensus Oct-1 binding sequence (5′-TGTCGAATGCAAATCACTAGAA-3′; Promega). For determination of PPARγ-DNA binding, a double-stranded oligonucleotide containing the PPRE from the acyl-coenzyme A (acyl-coA) oxidase gene (5′-GTCGACAGGGGACCAGGACAAAGGTCACGTTCGGGAGTCGAC-3′) (22) was used. The consensus sequence is underlined. PPARγ binds to this site with significantly greater affinity than PPARα (58). The DNA probe was end labeled and purified as described above. EMSA was performed as follows. 32P-labeled DNA (∼0.5 ng, 60,000 cpm) and 4 μg of nuclear protein were combined with buffer (final concentrations, 20 mM HEPES (pH 8), 0.2 mM EDTA, 60 mM sodium chloride, 0.1% Nonidet P-40, 1 mM DTT, and 10% glycerol) and poly(dI-dC) (1 μg) in a final volume of 20 μl. The mixture was incubated at room temperature for 30 min. The gel was run as described above, dried, and exposed to film. The specificity of the shifted bands was determined by including Abs specific for PPARγ, 100× cold oligonucleotides containing the PPRE from the acyl-coA oxidase gene, the PPARγ half-site of the PPRE from the acyl-coA oxidase gene (5′-AGCTGGACCAGGACAAA-3′), or an unrelated site (5′-GATCTGGCTCTTCTCACACAACTCCGGATC-3′). Statistical analyses were performed with SPSS 8.0 for Windows (SPSS, Chicago, IL). One-factor ANOVAs were used to analyze the data. Dunnett’s multiple comparisons test was used to determine significant differences. Previous studies suggested that B cells in the later stages of development are susceptible to PPARγ-mediated apoptosis (45). Information on PPARγ and its role in the developing immune system is very limited. The effects of PPARγ agonists on developing lymphocytes are of particular concern given the increased sensitivity of the developing immune system to other environmental chemicals (34, 35, 36, 37) and therapeutics (38). Therefore, we designed these studies to investigate the effects of PPARγ agonists on B cells at early stages of development. Ciglitazone is a thiazolidinedione, a class of chemicals currently in use as a treatment for type II diabetes (23). BU-11 cells exhibited a relatively low level of background apoptosis (<19%), as measured by propidium iodide staining and flow cytometric analysis (Fig. 1⇓A). Treatment with 80 μM ciglitazone rapidly (i.e., within 4 h) and consistently induced apoptosis in a large fraction (>85%) of these pro/pre-B cells. Apoptosis induction was not development stage-specific, since >65% of the WEHI-231 immature B cells similarly underwent apoptosis within 6 h (Fig. 1⇓A). Analyses of an early marker of apoptosis, annexin V staining, indicated that >90% of either the BU-11 or WEHI-231 population was induced to undergo apoptosis within 4–6 h (Fig. 1⇓B). Detection of apoptotic WEHI-231 cells with the annexin stain at a somewhat later time point (6 h) could reflect a slightly delayed kinetics of apoptosis in these immature B cells. As expected, DNA fragmentation, a hallmark of apoptosis, was readily demonstrable in both cell populations following a 6- to 8-h exposure to ciglitazone (Fig. 1C⇓). Finally, the activation of effector caspase 3 (59) was substantiated by the demonstration of PARP cleavage following ciglitazone exposure (Fig. 1⇓D). The PPARγ agonist ciglitazone induces apoptosis in pro/pre-B cells (BU-11) and immature B cells (WEHI-231). Suspension cultures of BU-11 or WEHI-231 were treated in 24-well plates with ethanol (vehicle; 0.01%) or ciglitazone (80 μM) for the time indicated. Assays were performed as indicated in Materials and Methods. Treatment with ciglitazone results in formation of a sub G0/G1 population following propidium iodide staining (A), increased annexin V staining (B; black line), DNA ladder formation (C), and formation of the 76-kDa cleavage product of PARP (D). The results shown are representative of at least three independent experiments. 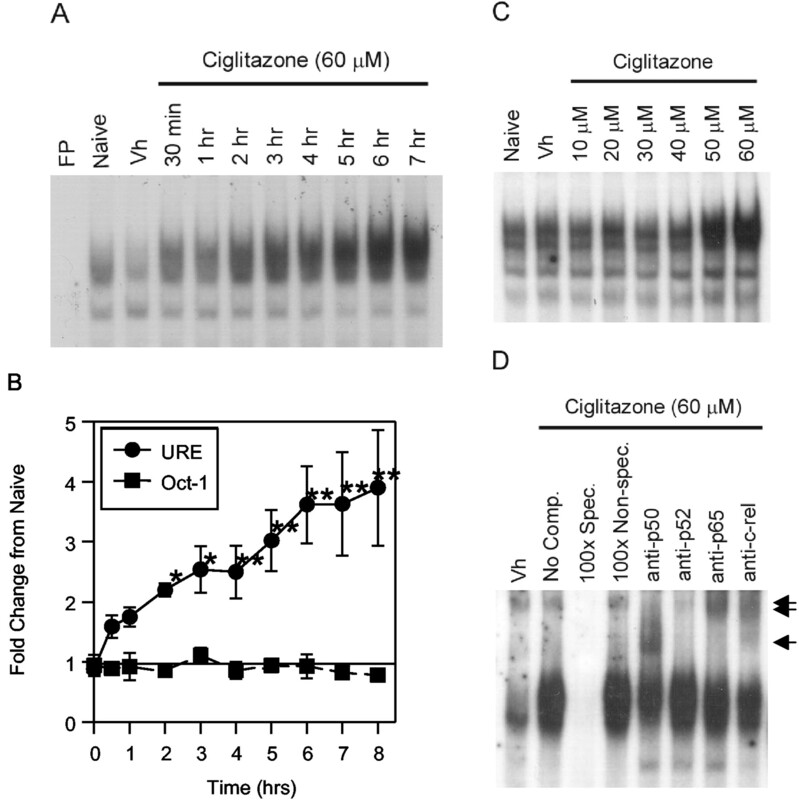 While ciglitazone is a known PPARγ agonist, it is possible that its ability to induce pro/pre-B cell apoptosis in these cell lines is related to other pharmacologic activities. To address this possibility and to extend studies to a more potent PPARγ agonist, BU-11 and WEHI-231 cells were exposed, as described above, to GW7845, a PPARγ agonist and tyrosine analog whose chemical structure is considerably different from that of ciglitazone (23). 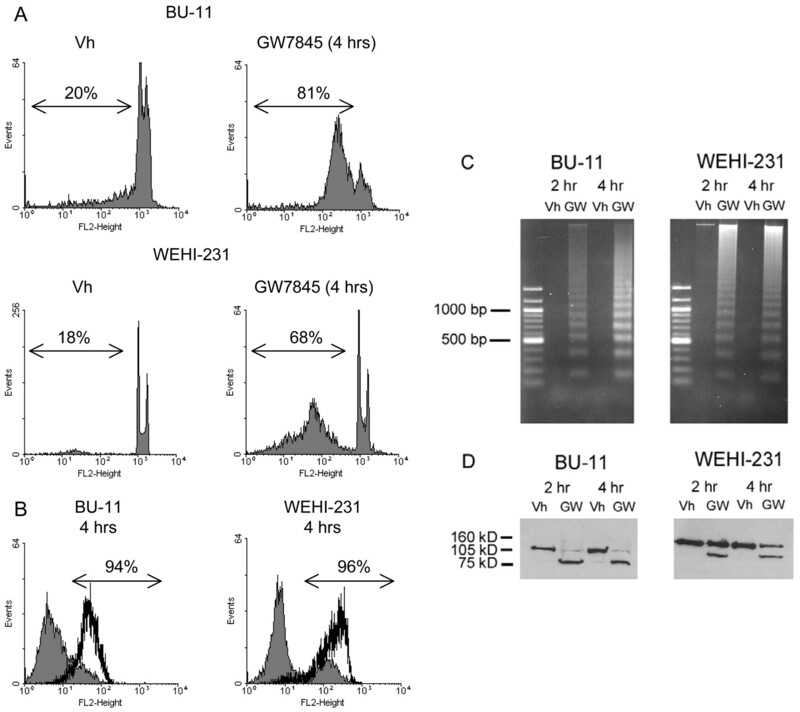 In this series of experiments, GW7845 induced greater than 80 and 65% of BU-11 and WEHI-231 cells, respectively, to undergo apoptosis within 4 h (Fig. 2⇓A). Greater than 90% of BU-11 or WEHI-231 cells had entered the early phase of apoptosis by 4 h as measured by annexin V staining (Fig. 2⇓B). In keeping with the greater potency of GW7845 (23), DNA fragmentation (Fig. 2⇓C) and PARP cleavage (Fig. 2⇓D) were seen at an earlier time point, i.e., 2 h, than following ciglitazone treatment. PARP cleavage at both the 2- and 4-h time points was more profound in the pro/pre-B BU-11 cells than in the immature WEHI-231. The PPARγ agonist GW7845 induces apoptosis in pro/pre-B cells (BU-11) and immature B cells (WEHI-231). Suspension cultures of BU-11 or WEHI-231 were treated with ethanol (vehicle; 0.01%) or GW7845 (60 μM) for the time indicated and analyzed for propidium iodide staining (A), annexin V staining (B), DNA ladder formation (C), and PARP cleavage (D), as described in Fig. 1⇑. The results shown are representative of at least three independent experiments. 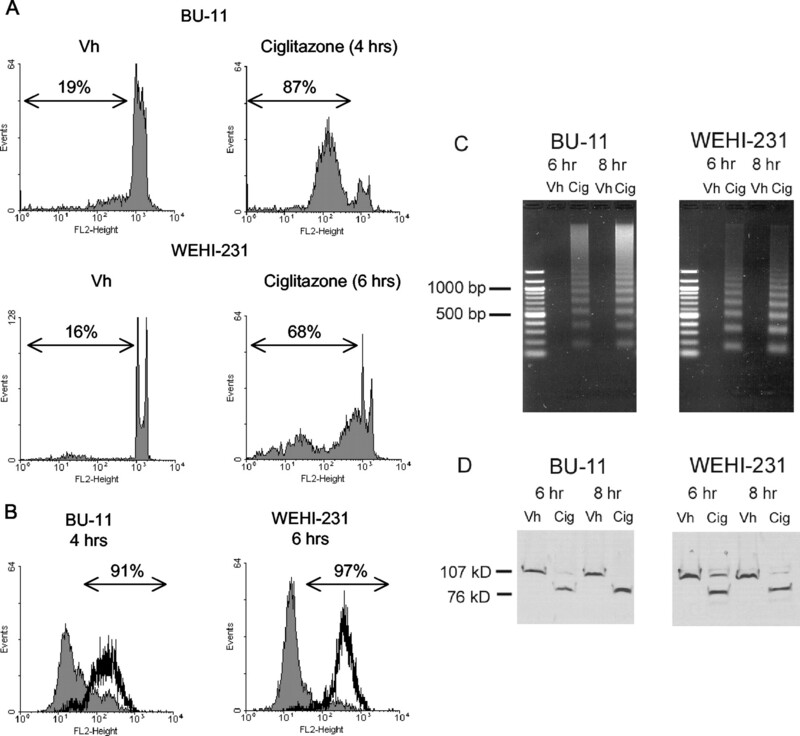 Both ciglitazone and GW7845 induced B cell apoptosis in a dose-dependent manner (Fig. 3⇓). In the presence of serum, the EC50 in BU-11 cells following GW7845 exposure was significantly lower than that for ciglitazone (24 vs 51 μM; p < 0.05). Similarly, in WEHI-231 cells, the EC50 for GW7845 was 38 μM, and that for ciglitazone was 52 μM (p < 0.05). Interestingly, the EC50 for ciglitazone-treated BU-11 cells was reached at ∼10-fold lower concentrations (5 μM) in the absence of serum (data not shown). This may be an important consideration when comparing results from different studies. 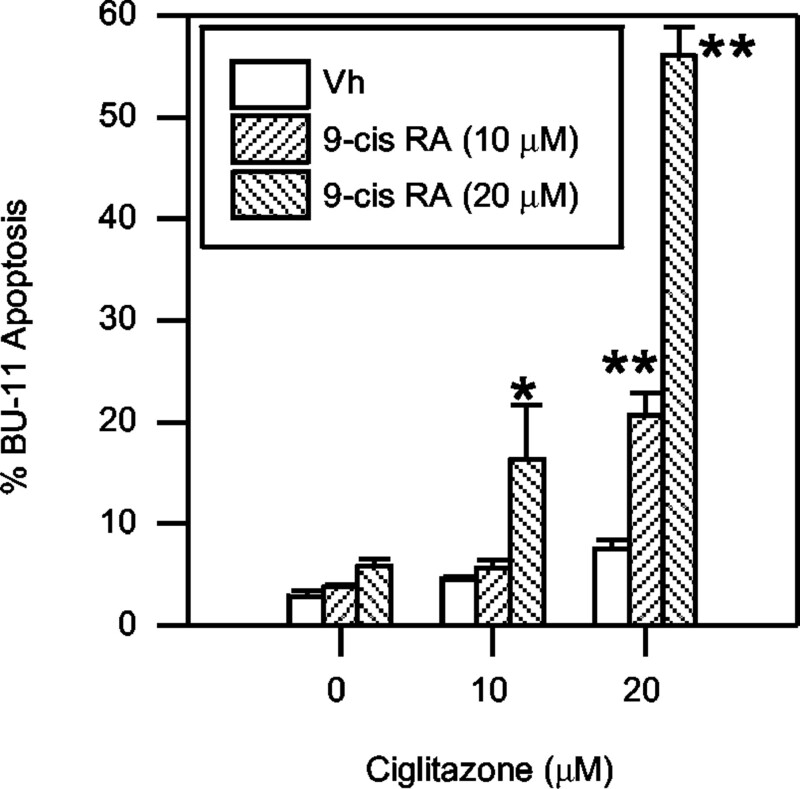 Ciglitazone and GW7845 induce apoptosis in a dose-dependent manner. A, BU-11; B, WEHI-231. Suspension cultures of B cells were treated in 96-well plates with ethanol (vehicle; 0.1%), ciglitazone, or GW7845 at the concentrations indicated. After 2 h MTT reagent was added, and the incubation was continued. After 4 h solubilization reagent was added. Cultures were allowed to solubilize overnight before being read. In the BU-11 experiments, absorbance values for vehicle-treated cells were 0.878 ± 0.067 and 0.854 ± 0.048 for ciglitazone and GW7845 experiments, respectively. 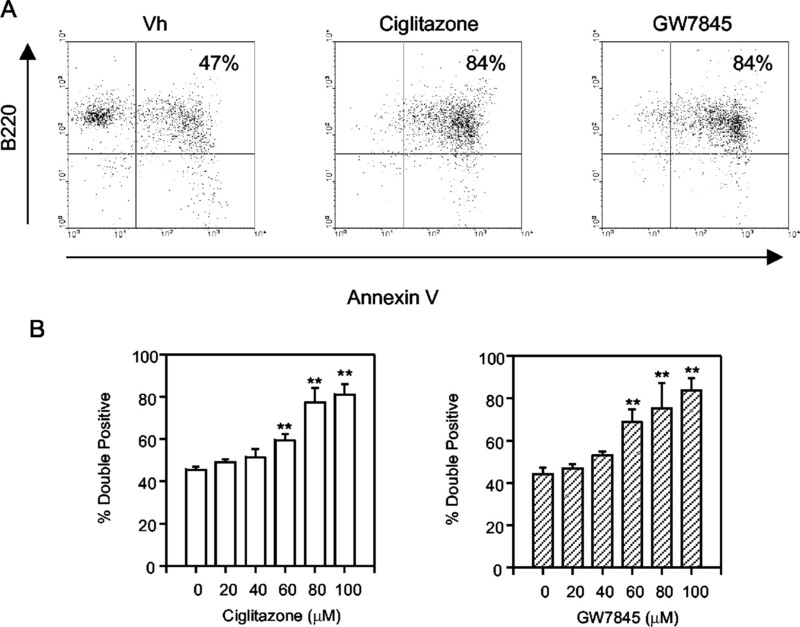 In the WEHI-231 experiments, absorbance values for vehicle-treated cells were 0.789 ± 0.025 and 0.804 ± 0.024 for ciglitazone and GW7845 experiments, respectively. Data are presented as the mean ± SE from three or four independent experiments. ∗∗, p < 0.01 vs vehicle-treated cells (by ANOVA, Dunnett’s test). Approximately 40% of the primary bone marrow B cells were double positive for B220 and annexin V in the absence of treatment, representing a relatively rapid turnover of B cells in the marrow. However, treatment with 60–100 μM PPARγ agonists, ciglitazone, or GW 7845, rapidly (i.e., within 4 h) induced a significant increase in annexin V staining (Fig. 4⇓). Consequently, it was concluded that bone marrow B cells, the majority of which are surface Ig−, pre-B cells, are exquisitely sensitive to PPARγ agonists. PPARγ agonists induce apoptosis in primary bone marrow B cells. B cells were isolated from bone marrow by the method described by Tze et al. (52 ). Suspension cultures were treated in 24-well plates with ethanol (vehicle; 0.01%), ciglitazone, or GW7845 at the concentrations indicated for 4 h. B220/annexin V double staining was performed as described in Materials and Methods. A, Dot plots of B220 vs annexin V staining in vehicle-, ciglitazone-, or GW7845 (80 μM)-treated cells. B, Quantification of B220+/annexin V+ staining. Data are presented as the mean ± SE from experiments with cells from three individual mice. ∗∗, p < 0.01 vs vehicle-treated cells (by ANOVA, Dunnett’s test). PPARγ along with its dimerization partner RXRα are expressed in mature B cell lines (45). To determine whether PPARγ is constitutively expressed at the pro/pre-B cell stage, protein was extracted from BU-11 cells and, as a positive control, from WEHI-231 cells and was analyzed by Western blot. Both cell types express significant levels of PPARγ (Fig. 5⇓A). 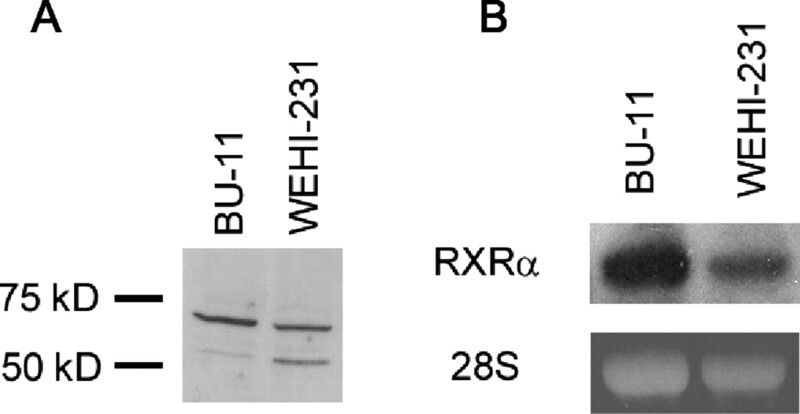 Similarly, RXRα mRNA was present in both BU-11 and WEHI-231 (Fig. 5⇓B). B cells in early maturation stages express both PPARγ (A) and RXRα (B). Cytoplasmic proteins from untreated BU-11 and WEHI-231 cells were denatured, electrophoresed, transferred to nitrocellulose, immunoblotted with pAb against PPARγ, and visualized using enhanced chemiluminescence. RXRα expression was determined by Northern blot as described in Materials and Methods. Given the presence of both PPARγ and RXRα in the BU-11 pro/pre-B cell line, it was predicted that both ciglitazone and GW7845 would induce binding of the PPARγ complex to its DNA recognition element, with GW7845 probably being a more potent inducer of PPARγ-PPRE binding. 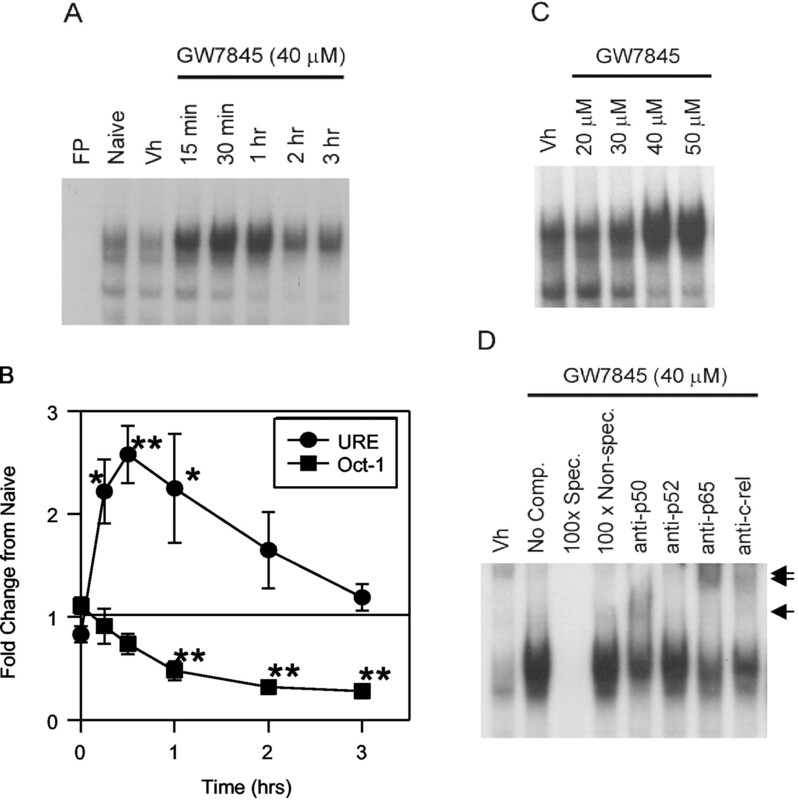 Indeed, treatment of BU-11 cells with ciglitazone and GW7845 resulted in a time-dependent increase in binding to the PPRE sequence from the acyl-coA oxidase gene (Fig. 6⇓A). As with other assays, GW7845 was the more potent agonist, inducing PPARγ complex-PPRE binding within 15 min. The specificity of DNA binding was confirmed by competition from 100× cold sequence containing the PPRE from the acyl co-A oxidase gene and the lack of competition by the PPARγ half-site of the PPRE from the acyl-coA oxidase gene or an unrelated sequence (Fig. 6⇓B). In addition, the PPARγ complex-PPRE band could be supershifted with an Ab specific for PPARγ. These results demonstrate that PPARγ was activated in these cells following agonist exposure. Ciglitazone and GW7845 induce PPARγ-DNA binding. A, Nuclear extracts were prepared from ethanol- (vehicle; 0.01%), ciglitazone- (80 μM), or GW7845 (60 μM)-treated BU-11 cells at the times indicated and analyzed by EMSA for 32P-labeled PPRE oligonucleotide binding, as described in Materials and Methods. B, Competition analyses were performed by including a 100× excess of cold probe, mutant probe containing only the PPARγ half-site of PPRE from the acyl-coA oxidase gene, or an unrelated site. Supershift analyses were performed by including 2 μl of nonspecific rabbit IgG or pAb specific for PPARγ. The results shown are representative of three independent experiments. Fp, free probe. Although implicated in PPARγ signaling for a number of biologic outcomes (31, 60), the role of the RXRα in delivering the apoptosis signal in B lymphocytes has not been addressed. RXRα signaling has been found to be involved in T lymphocyte (61) and leukemic myeloid precursor cell apoptosis (62). To evaluate the contribution of the RXRα to pro/pre-B cell apoptosis, BU-11 cells were treated with limiting doses of ciglitazone (10 or 20 μM) with or without 10 or 20 μM 9-cis-retinoic acid. Addition of 10–20 μM 9-cis-retinoic acid or 10 μM ciglitazone to BU-11 cell cultures had no significant affect on the viability of BU-11 cells (Fig. 7⇓). In contrast, cotreatment with 10 μM 9-cis-retinoic acid and 20 μM ciglitazone synergistically increased the incidence of BU-11 apoptosis from a relatively low background level of ∼3–6 to 21% (Fig. 7⇓). Similarly, addition of 20 μM 9-cis-retinoic acid along with 20 μM ciglitazone increased apoptosis from 7% in cultures treated with 20 μM ciglitazone alone to 56% (p < 0.01). These data are consistent with a role for the RXRα in ciglitazone-mediated pro/pre-B cell apoptosis. 9-Cis-retinoic acid synergistically increases PPARγ agonist-induced apoptosis. Suspension cultures of BU-11 cells were treated in 24-well plates with ethanol (vehicle; 0.01%), ciglitazone, or 9-cis-retinoic acid (9-cis RA) at the concentrations indicated for 18 h. Cells were harvested and washed with PBS. The percentage of apoptotic cells was determined by propidium iodide staining as described in Materials and Methods. The percentage of cells undergoing apoptosis was determined from the proportion of cells with weaker propidium iodide fluorescence than those typically in the G0/G1 phase of the cell cycle. Data are presented as the mean ± SE from three independent experiments. ∗, p < 0.05 vs vehicle-treated cells; ∗∗, p < 0.01 vs vehicle-treated cells (by ANOVA, Dunnett’s test). Previous studies suggested that activation of PPARγ can either down-regulate NF-κB (13, 14, 15) or cooperatively enhance NF-κB-mediated transcription (49). Since we have shown that NF-κB modulation in WEHI-231 and BU-11 cells activates the cell death signaling pathway (46, 47), it was postulated that PPARγ activation would affect NF-κB activity either before or concomitant with apoptosis induction. To test this hypothesis, BU-11 cells were treated with ciglitazone for 30 min to 8 h, and nuclear proteins were extracted and assayed by EMSA for binding to the URE of c-myc. As predicted, analysis of NF-κB-DNA band densities indicated that treatment with ciglitazone resulted in a time-dependent increase in NF-κB-DNA binding (Fig. 8⇓A). NF-κB-DNA binding increased as early as 1 h post-treatment and climbed to a maximum of 3.6-fold at 6–7 h post-treatment (Fig. 8⇓B). The failure to detect a change in binding of the constitutively active Oct-1 transcription factor with its cognate DNA binding element demonstrated the specificity of the NF-κB response (data not shown). Only doses of ciglitazone that induced apoptosis (i.e., >40 μM) induced an increase in NF-κB-DNA binding (Fig. 8⇓C). Competition studies confirmed the specificity of the bands, and supershift assays determined that binding of p50, p65, and c-rel contributed to the increase (Fig. 8⇓D). Ciglitazone activates NF-κB-DNA binding in early B cells. Nuclear extracts were prepared from ethanol (vehicle; 0.01%) or ciglitazone-treated BU-11 cells at the concentrations and times indicated and were analyzed by EMSA for 32P-labeled NF-κB and Oct-1 oligonucleotide binding. A, Time course of NF-κB activation following treatment with 60 μM ciglitazone. B, The relative fold increase in NF-κB-DNA binding was quantified using a PhosphorImager. Data are presented as the mean ± SE from three or four separate experiments. ∗, p < 0.05 vs vehicle-treated cells; ∗∗, p < 0.01 vs vehicle-treated cells (by ANOVA, Dunnett’s test). C, Doses required to activate NF-κB-DNA binding approximate those required to initiate apoptosis (determined at 4 h). The results shown are representative of three independent experiments. D, Competition analyses were performed by including a 100× excess of cold probe or an unrelated site. Supershift analyses were performed by including 2 μl of pAb specific for p50, p52, p65, or c-rel. The arrows indicate the positions of supershifted bands. The results shown are representative of three independent experiments. Fp, free probe. Similarly, GW7845 treatment activated NF-κB-DNA binding, and the effect was more rapid than that observed with ciglitazone (Fig. 9⇓). That is, NF-κB-DNA binding increased as early as 15 min post-treatment and peaked at 1 h, with a maximum 2.5-fold increase in binding. NF-κB-DNA binding dropped rapidly after 1 h, coincident with a decrease in Oct-1-DNA binding that presumably reflected the rapid demise of GW7845-treated cells. Only doses of GW7845 that caused significant apoptosis (>30 μM) stimulated NF-κB-DNA binding. GW7845 activates NF-κB-DNA binding in early B cells. Nuclear extracts were prepared from ethanol-treated (vehicle; 0.01%) or GW7845-treated BU-11 cells at the concentrations and times indicated and were analyzed by EMSA for 32P-labeled NF-κB and Oct-1 oligonucleotide binding. A, Time course of NF-κB activation following treatment with 40 μM GW7845. B, The relative fold increase in NF-κB-DNA binding was quantified using a PhosphorImager. Data are presented as the mean ± SE from three independent experiments. ∗, p < 0.05 vs vehicle-treated cells; ∗∗, p < 0.01 vs vehicle-treated cells (by Dunnett’s test). C, Doses required to activate NF-κB-DNA binding approximate those required to initiate apoptosis (determined at 2 h). The results shown are representative of three independent experiments. D, The specificity of NF-κB-DNA binding and the identities of the NF-κB subunits were determined by competition and supershift analyses, as indicated in Fig. 7⇑. The arrows indicate the positions of supershifted bands. The results shown are representative of three independent experiments. Fp, free probe. If NF-κB is involved in apoptosis induction, it would be predicted that addition of 9-cis-retinoic acid would increase NF-κB-DNA binding synergistically, as it increased the induction of apoptosis. A dose of 9-cis-retinoic acid (40 μM) that had no effect on apoptosis (data not shown) similarly had no effect on NF-κB-DNA binding (Fig. 10⇓A). Consistent with results presented in Figs. 3⇑ and 8⇑, 30 μM ciglitazone had no significant effect on either apoptosis or NF-κB-DNA binding (Fig. 10⇓A). However, doses of ciglitazone as low as 30 μM, in combination with 40 μM 9-cis-retinoic acid, synergized to generate an increased level of NF-κB-DNA binding. 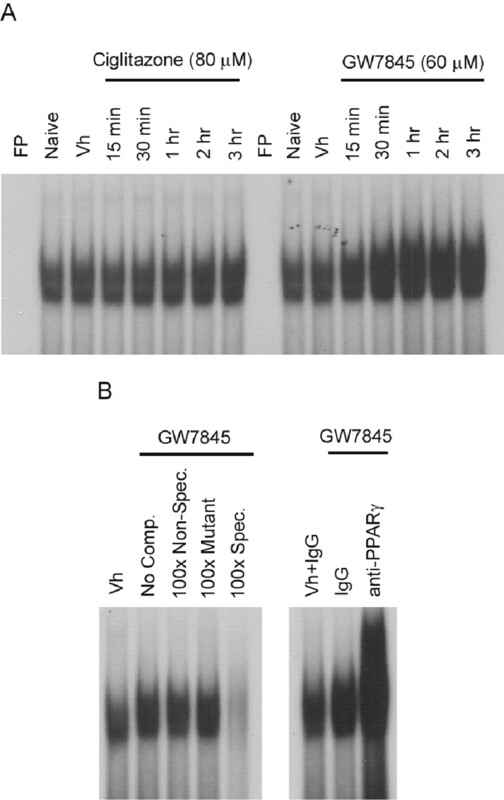 Similarly, a combination of 20 μM GW7845 and 40 μM 9-cis-retinoic acid synergistically increased NF-κB binding (Fig. 10⇓B). The combination of 30 μM GW7845 and 40 μM 9-cis-retinoic acid resulted in a significant reduction in Oct-1 binding (data not shown), suggesting that there was an increase in PPARγ-mediated cell death at this dose as well. 9-Cis-retinoic acid stimulates PPARγ agonist-mediated activation of NF-κB-DNA binding. A, Ciglitazone; B, GW7845. Nuclear extracts were prepared from ethanol- (vehicle; 0.01%), 9-cis-retinoic acid- (40 μM), ciglitazone-, or GW7845-treated BU-11 cells at the concentrations indicated. Ciglitazone-treated cells were harvested at 6 h. GW7845-treated cells were harvested at 1 h. Extracts were analyzed by EMSA for 32P-labeled NF-κB oligonucleotide binding. Fp, free probe. The results shown are representative of at least three independent experiments. PPARγ has the potential to influence multiple functions of the immune system. It has been shown to regulate macrophage inflammatory responses (11, 12, 13, 14, 15); T cell activation, proliferation, and production of inflammatory cytokines (16, 17, 18); endothelial cell production of chemokines (19); and dendritic cell maturation (20). A growing body of evidence suggests that PPARγ may play a role in B cell function as well (21, 45). Here we show for the first time that cells in the developing immune system are sensitive to the effects of PPARγ agonists. We show that PPARγ agonists rapidly induce apoptosis in primary B cells from the bone marrow and in a B cell line representing the pro/pre-B cell stage. The role of PPARγ in stimulating apoptosis is substantiated by the facts that pro/pre B cells express PPARγ and RXRα, that PPARγ-DNA binding increases in response to agonist exposure, and that cotreatment with PPARγ and RXRα agonists synergistically increases the incidence of apoptosis. Furthermore, apoptosis is preceded by a profound increase in NF-κB-DNA binding, suggesting a role for this transcription factor in the death of early B cells. PPARγ agonists, including 15d-PGJ2 and glitazone drugs, induce apoptosis in cells of the immune system, including monocytes (14) and T cells (63). Critical initial studies by Padilla et al. (45) suggested that the mechanism of B cell death was PPARγ-dependent, since PPARγ-selective glitazone drugs induced apoptosis. In addition, 15d-PGJ2, but not a control prostanoid PGF2α, induced apoptosis; 15d-PGJ2 had greater potency in inducing apoptosis than any other compound tested, potentially reflecting the greater affinity of 15d-PGJ2 for PPARγ binding and/or its ability to directly interact with NF-κB family members (64). The potential for 15d-PGJ2-mediated NF-κB down-regulation to induce apoptosis in pro/pre-B cells is currently under investigation. The data presented here demonstrate the high level of sensitivity of the developing immune system to PPARγ agonists. It was shown that pro/pre-B cells are exquisitely sensitive to PPARγ agonists. Primary bone marrow B cells, as well as an established, stromal cell responsive pro/pre-B cell line, undergo apoptosis as early as 2 h after exposure to PPARγ agonists. Our results provide substantial evidence that the mechanism of death is PPARγ-dependent. First, apoptosis was induced by two structurally diverse PPARγ ligands: ciglitazone, a thiazolidinedione, and GW7845, a tyrosine analog (23). The concentrations required to induce death in B cells were significantly greater (10-fold) than those reported previously (45). However, in the previous studies serum was not present during the initial exposure to the agonists, a factor we have shown here to significantly reduce the concentration required to induce apoptosis. A similar phenomenon has been noted for ligands of the aryl hydrocarbon receptor (45). GW7845 induced B cell death both at a lower dose and in a more rapid manner than ciglitazone, potentially reflecting a higher affinity for the receptor (23). Evaluation of apoptosis at early time points (i.e., 2–4 h) revealed the extremely rapid manner in which PPARγ agonists induce apoptosis, a previously unrecognized feature of PPARγ-mediated apoptosis. Second, not only are PPARγ and its dimerization partner RXRα expressed in B cells in early stages of development, they are capable of activation and DNA binding. Studies have shown that PPARγ (3, 7, 45) and RXRα (33, 65) are expressed in B lineage cell lines and mature B cells in vivo, but have not addressed their expression in the developing immune system or their competence for activation in B cells. We show here that B cell lines representing the pro/pre- and immature B cell stages express PPARγ and RXRα. In addition, we demonstrate that the PPARγ:RXRα heterodimer is capable of DNA binding in B cells. The increase in PPARγ-DNA binding following agonist exposure indicates that PPARγ has been activated in these B cells and potentially could participate in initiating a death program. Finally, the participation of the PPARγ:RXRα heterodimer in initiation of apoptosis is indicated by the synergistic increase in the incidence of apoptosis in the presence of agonists for both receptors. The PPARγ:RXRα heterodimer is known as a permissive heterodimer in which RXR ligands alone can activate transcription by the heterodimer (66). Cotreatment with ligands for both PPARγ and RXRα results in a synergistic increase in PPARγ-dependent trans-activation of reporter genes, adipocyte differentiation in cultured cells (67), and differentiation of liposarcomas in vivo (60). Synergy results from increased recruitment of coactivators and an RXR-dependent conformational change in PPARγ (31). In addition, RXRα signaling has been found to be involved in T lymphocyte (61) and leukemic myeloid precursor cell apoptosis (62). A physiological role for PPARγ in B cells is suggested by studies with PPARγ haploinsufficient mice (21). There is an increased proliferative response of B cells from PPARγ haploinsufficient mice following stimulation by LPS or cross-linking of Ag-specific receptors. In addition, haploinsufficient mice show increased levels of specific Abs following immunization with either OVA or mBSA. These effects may be linked to a dysregulation of the NF-κB pathway. There was an increase in spontaneous NF-κB activation as well as increased IκBα phosphorylation and NF-κB-DNA binding following LPS exposure in B cells from PPARγ+/− mice. A growing number of studies have highlighted the interaction of PPARγ and NF-κB. The majority of research has suggested that both natural and synthetic PPARγ agonists antagonize NF-κB-DNA binding and trans-activation stimulated by activators such as LPS, TNF-α, PMA, and IL-1β (13, 14, 15, 16, 48, 68, 69, 70, 71, 72, 73). Most studies show a decrease in NF-κB-DNA binding or trans-activation that may result from IκB kinase inhibition (73) or from the physical interaction of PPARγ and NF-κB (15). However, the results presented here suggest that PPARγ agonists alone can strongly stimulate NF-κB-DNA binding. The PPARγ dependence of the activation of NF-κB is suggested by the fact that cotreatment with an agonist for RXRα decreases the dose required to stimulate NF-κB activation. There is other evidence for a positive interaction between PPARγ and NF-κB. IL-1β-induced type II secreted phospholipase A2 expression requires the binding of both NF-κB and PPARγ, and they are suggested to cooperate at the enhanceosome-coactivator level (49). NF-κB and PPARγ are coordinately activated in human neuroblastoma cells following exposure to an Alzheimer’s peptide (50). Finally, rosiglitazone stimulates TNF-α-induced cyclooxygenase-2 expression in human colorectal carcinoma cells by up-regulating the TNF-α pathway potentially via NF-κB activation (51). The strong activation of NF-κB following exposure to PPARγ agonists may reflect an attempt to override the potent death signal induced by those agonists. Generally NF-κB is thought of as a survival factor, typified by its protection against TNF-α-, anti-B cell receptor-, or environmental pollutant-induced cell death (46, 47, 74). However, the activation of NF-κB also could initiate the death signal. Indeed, NF-κB was initially described as a pro-apoptotic factor (75, 76, 77) required for bacteria- and virus-induced cell death (73, 78), Fas ligand-induced apoptosis in T lymphocytes (79), and p53-mediated cell death initiated by such stimuli as UV radiation (80). Interestingly, activation of NF-κB via the mitogen-activated protein kinase pathway is required for p53-mediated apoptosis (80). PPARγ ligands, both 15d-PGJ2 and glitazone drugs, have been shown to up-regulate the same pathway (81). It remains to be determined whether the PPARγ agonists used in these studies up-regulate mitogen-activated protein kinase in BU-11 and whether this may be related to the increase in NF-κB activation. Attempts to confirm a causal relationship between PPARγ agonist-induced NF-κB up-regulation and cell death have been hampered by the fact that concentrations of NF-κB inhibitors required to block such a strong and rapid activation of NF-κB tend to rapidly reduce the baseline levels of NF-κB, a signal that also induces BU-11 cell apoptosis (46). While the results presented here suggest that ciglitazone and GW7845 initiate apoptosis via a PPARγ-dependent mechanism, they do not rule out the possibility that PPARα also may participate in initiating apoptosis in B cells. PPARα and PPARγ are both expressed in lymphocytes and myeloid cells. While PPARγ is expressed more highly than PPARα in myeloid lineage cells, PPARα is the dominant form in lymphocytes (2). The potential for interaction between PPARα and PPARγ is suggested by overlapping agonist specificities (82). In general, the results presented here and previously (21, 45) suggest that PPARγ may be involved in B cell development, proliferation, and immune responsiveness. The demonstration here that the developing B cell compartment is particularly sensitive to PPARγ agonists emphasizes a mechanism through which environmental PPARγ agonists could suppress the immune system and suggests possible debilitating side effects of PPARγ agonist therapeutics. Additional research is required to define the nominal role of PPARγ in early B cells, particularly with regard to its influence on NF-κB, a critical element in normal B cell development and function. ↵1 This work was supported by National Institutes of Health Grant RO1ES06086 and Superfund Basic Research Grant 1P42ES07381. ↵3 Abbreviations used in this paper: PPAR, peroxisome proliferator-activated receptor; acetyl-coA, acyl-coenzyme A; MTT, 3-[4,5-dimethylthiazol-2-yl]-2,5-diphenyltetrazolium bromide; 15d-PGJ2, 15-deoxy-Δ12,14-PGJ2; RXR, retinoid X receptor; URE, upstream κB regulatory element; PARP, poly(ADP-ribose) polymerase. Tsubouchi, Y., S. H., Y. Kawahito, S. Mukai, R. Yamada, M. Kohno, K.-i. Inoue, T. Hla, and M. Kondo. 2000. Inhibition of human lung cancer growth by the peroxisome proliferator-activated receptor-γ agonists through induction of apoptosis. Biochem. Biophys. Res. Commun. 270:400. Padilla, J., K. Kaur, C. H. J., T. J. Smith, and R. P. Phipps. 2000. Peroxisome proliferator activator receptor-γ agonists and 15-deoxy-Δ12,14-PGJ2 induce apoptosis in normal and malignant B-lineage cells. J. Immunol. 165:6941.